Parking directly at the Beach of Limni Vouliagmenis. The Water is salted, cause there is a little Canal to the Sea. Two Beach Bars are near. The Beach is with Stones – in the Water a part with sand, after Stones again. This Articel was read 246 times! 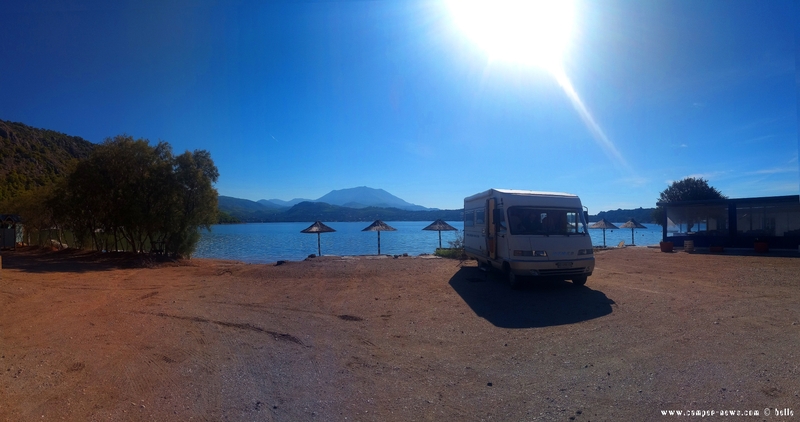 Dieser Beitrag wurde in Countries, Free Camping - Wild Camping, GPS, Greece, Travel-Facts veröffentlicht und mit CampingCar, Coast, Corinth, Corinthia, Free-Camping, Freistehen mit dem Wohnmobil in Griechenland, Grecia, Greece, Griechenland, Küste, Limni Vouliagmenis, Limnis Vouliagmeni, Loutrakiou, Mediterranean Coast, Meer, Mittelmeer, Motorhome, Parking at the Limni Vouliagmenis - Greece - October 2018, Peloponnese, Reise, Reisebericht, Reiseberichte, Reiseblog, Reisen, Reisen im Wohnmobil, Reisen im Womo, Reisen in Spanien, Reisen in Spanien mit dem Wohnmobil, Reisen mit dem WoMo in Spanien, Salzwasser, Sand, Sonne, Strand, Travel, Travel in Greece, Travel with a Camping Car, Travel with a CampingCar, Travel with the Camping Car in Greece, Travel with the CampingCar in Greece, Travel with the Motorhome, Travel with the MotorHome in Greece, Travelblog, Travelbook, Unser Camper, Wild-Camping getaggt.